The MacBook is a brand of Macintosh notebook computers by Apple Inc.
First introduced in May 2006, it replaced the iBook and 12" PowerBook series of notebooks as a part of the Apple Intel transition. Part of the MacBook family, the MacBook is aimed at the consumer and education markets. It is the best-selling Macintosh in history, and according to the sales-research organization NPD Group in October 2008, the mid-range model of the MacBook was the single best-selling laptop of any brand in U.S. retail stores for the preceding five months. There have been three separate designs of the MacBook: the original model uses a polycarbonate casing that was modelled after the iBook G4. 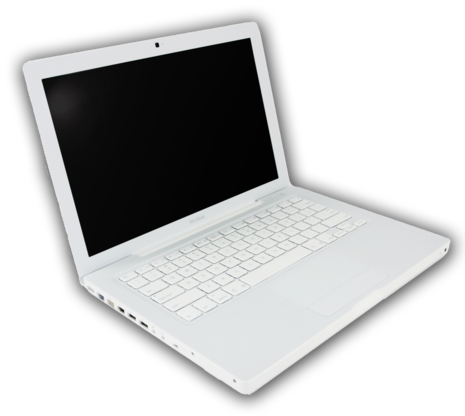 The second type, introduced in October 2008 alongside the 15" MacBook Pro, used a similar unibody aluminum casing to the 15" Pro, and was updated and rebranded as the 13" MacBook Pro at the 2009 Apple Worldwide Developers Conference in June 2009. A third design, introduced in October 2009, replaced the original casing with a unibody polycarbonate shell. Announced in January 2006, the MacBook Pro was the first portable Mac to use Intel Processors. The name for Apple's professional portable was ostensibly changed from PowerBook because Apple felt that all Macintoshes should have "Mac" in their product names, but was probably chosen because the Mac Book Pro no longer used a PowerPC processor—Though the PowerBook name predates the use of PowerPC processors, it was used in the naming of the Power Macintosh line to differentiate it from the previous 68k Macs.